I had the opportunity to visit True Tramm trunk on the special invite by FBAI. We were all there for a fun evening and an amazing time. An honest confession, I was here for the FBAI Quiz. The last time I had missed it and this time I was hell bound to experience the madness and check out my food quotient. One flight up, True Tramm Trunk is situated in a shopping complex in Juhu. I got an initial feel of ‘work in progress’ till I was greeted by this giant sized Indian lady coyly doing a ‘Namaste pose’. A huge long bar with some peppy music welcomed me. Have I been here before? Coz it looked like any other bar with filament bulbs, half done brick wall, and quirky graffiti. However I was thrilled to meet my fellow food bloggers after a long time. 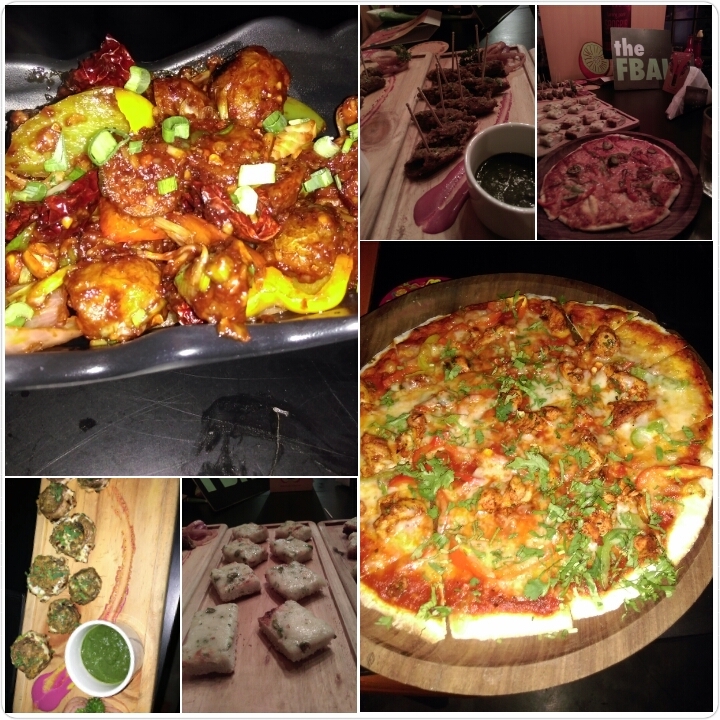 It was a FBAI (Food Bloggers Association of India) Soiree with Turning Point Sangria. Did you know that the Sangria is the largest selling cocktail in India? Yay! I am one of that true Indians who loves her Sangria. Quite impressed with the two types of Turning Point Sangria, the white Sangria and Metropolitan, the Red Sangria. This whole idea of “Sangria in a bottle” amazed me. The bottle was such a good looking one designed by Rabia Gupta as we were told by Turning Point owner and founder Mr Ashwin Deo. My favorite drink of the night, and a favorite with a lot of the others was the Metropolitan, SweetAnnu loves it sweet. Quirky cocktails in pint size bottles did the rounds. Took a sip of ‘Gulabo’ and it really got the ‘zarra Ittar faela do’ feel in me. Wanted to get up and dance. The food here is your typical bar food – snacky and goes well paired with booze. Most of all, I enjoyed the thin crust pizzas and piping hot fish fingers. But the best part of the evening was the #FBAI QUIZ. We all were randomly divided into teams. My team members were Nishkala, Salonee, Vaniitha Jain, Amrith Padmanand and Me 🙂 We were actually Team E but by default we got to be Team D. Check out our cosy corner, we just didn’t want to move. Final words : The true tramm fun at True Tramm trunk had to be the quiz, it was the cherry on the cake. A fabulous evening spent with FBAI team, Thanks Sameer and Salloni, for yet another successful FBAI bloggers Meet. And yes, Sangria is definitely my favourite potent. Cheers & Au revior. Until we meet again. ← The ‘A to Z’ of Bandra Eateries.